5 Reasons Why Sugar - Not Fat - Is the Problem - What The Fat? 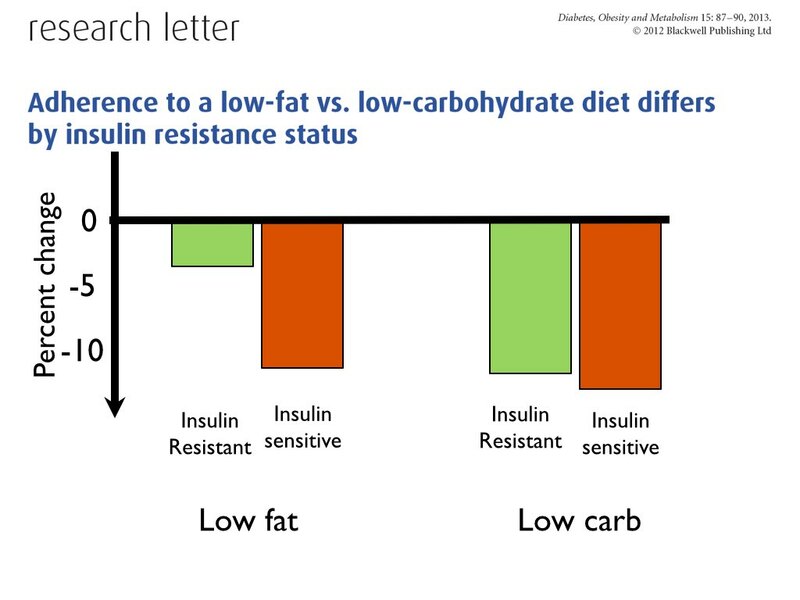 The most popular tweet that ever involved me was a picture of a slide in the Low Carb Downunder seminar I did with Dr Caryn Zinn and Professor Jeff Volek in Melbourne in June, 2015. Within days it had a few hundred thousand views. What did the slide say? This is my actual slide right below…. What we now know is that it’s the sugar not the fat that is causing the bulk of metabolic problems in society. The reason is that over-sugary blood is toxic and damages everything it touches. Insulin which manages your blood sugar is critical for life and good health (just ask any insulin-dependent diabetic), but constantly high insulin harms our health too. In fact, high insulin has been implicated in virtually every major metabolic problem from head to foot. 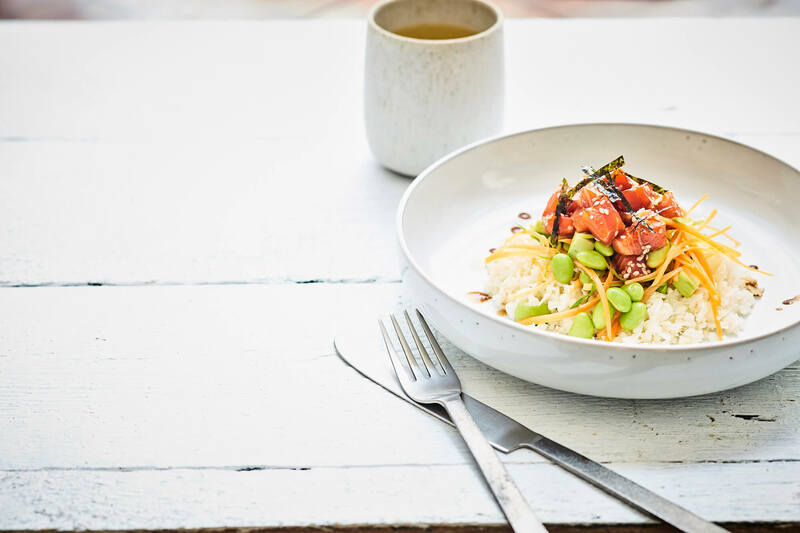 That’s why I decided that if you needed some sort of description of what the base of a good diet is then I have to be talking about whole, real food – food that is low in human interference as a start. Then that diet would have to help you maintain stable and normal blood sugars, and it would do so without you having to produce loads and loads of insulin. 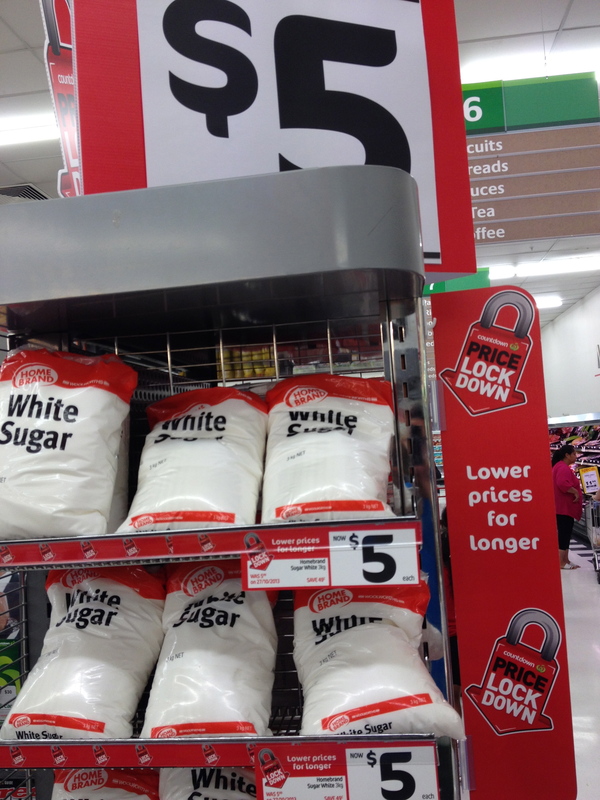 Again, sugary blood is toxic to the body (no debate about that). 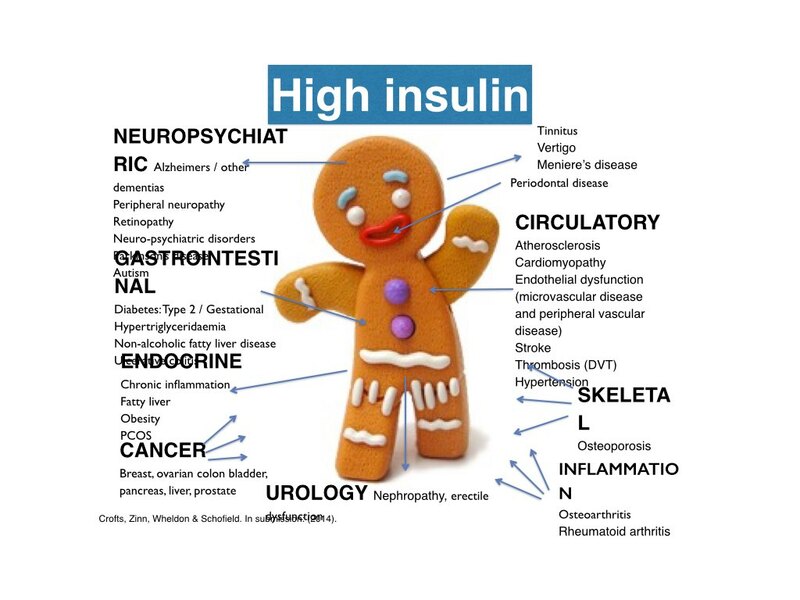 And even if you have normal blood sugars you may still be insulin resistant, which means you have to make loads of insulin to get the sugar from your blood into your cells. An insulin resistant person may have ten times as much insulin in their blood as a healthy person. That condition is called hyperinsulinemia. And this hyperinsulinemia is implicated in poor health in practically every part of the body (see diagram below from doctoral student of mine Catherine Crofts). Given all that, here’s my top five reasons why sugar (and carbs) are the problem, not fat. Insulin is a storage hormone. 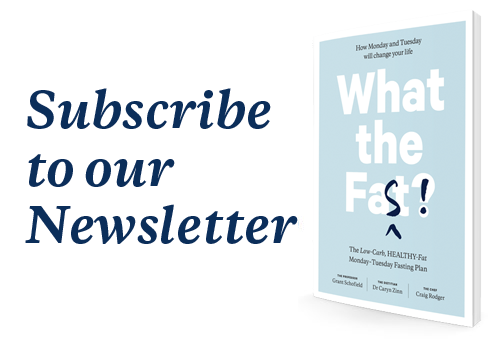 Here’s what it does – Insulin stores excess calories as fat. Insulin down-regulates how active you are. Insulin interferes with hunger signalling from the hormone leptin in the hypothalamus. Insulin turns off your ability to burn fat. It’s sugar and carbs that drive insulin up. Fat has no effect on insulin by itself. 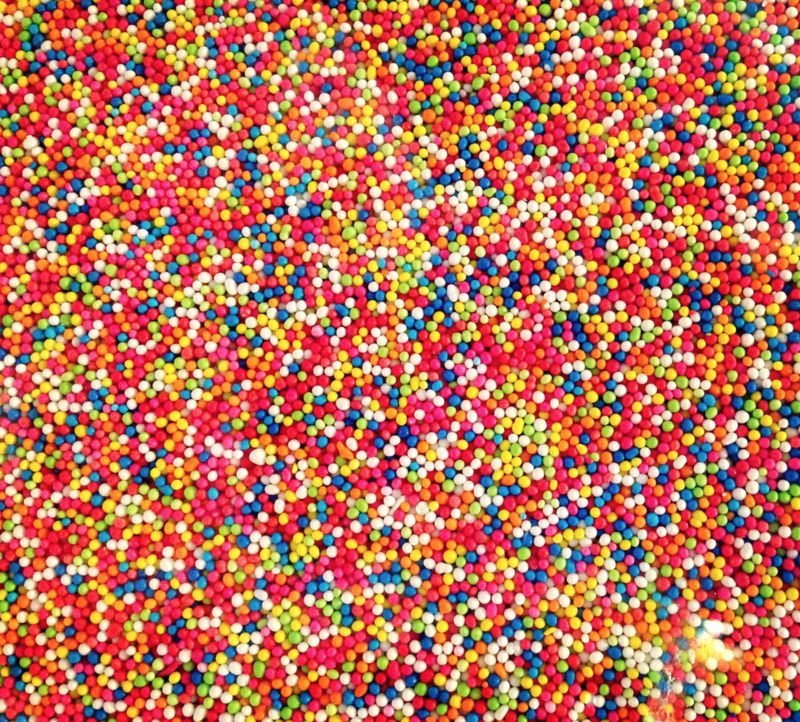 Consumed with sugar fat can be a problem. Solution, get rid of the sugary stuff. 2. The epidemiology shows sugar is associated with bad things like cardiovascular death, fat is not. 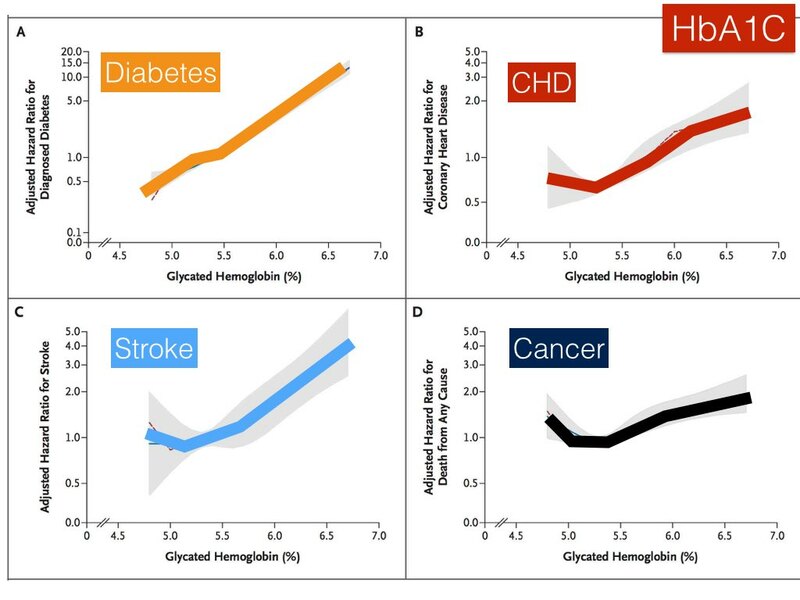 When you measure the sugar in people’s blood and follow them over long period, then you see that the higher the blood sugar the more chance they have of cancer, cardiovascular disease, and of course diabetes. The epidemiology consistently shows that high blood sugar is a risk for all of the major metabolic diseases. The first figure shows these risks in 11 092 people in the ARIC study. 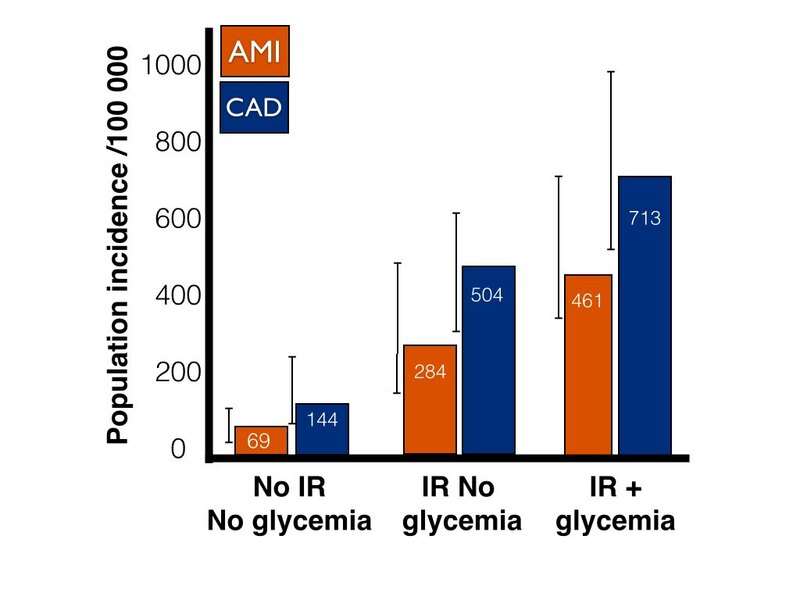 You can see in the second figure that both high insulin without high glucose in the blood, and high insulin and high glucose together are risks for coronary artery disease (CAD) and acute myocardial infarction (AMI) in this study following 11 092 people (click here for study). 3. Low carb high fat diets work well, especially for the insulin resistant. 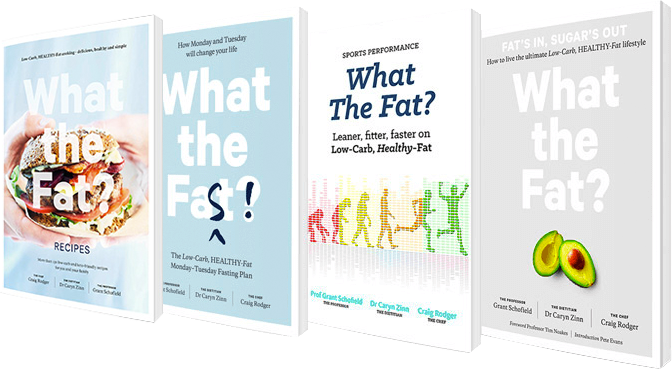 Chris Garner’s A to Z diet study which pitted a low carb high fat diet, the Zone and Learn diets and the Ornish low fat diet against one another in a randomised controlled trial. In the first figure below I’ve shown the results of the study for weight loss. 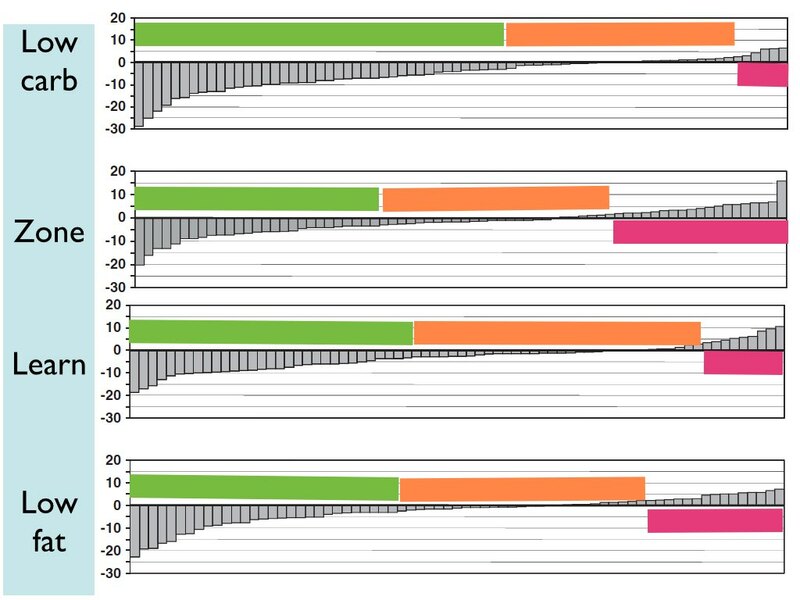 These are individual data (each grey vertical bar shows how much weight a person lost (or gained) on that diet.. I’ve drawn green bars to show the people who lost some weight. Orange bars to show those who stay more or less the same. And red bars to show those who gained weight. What’s interesting here is that this graph allows you to see what happens using a “number needed to treat” and “number needed to harm” analysis. You can judge for yourself, but my judgement is that the LCHF diet was the most effective for weight loss and least harmful? Individual weight loss on the four diets in the A to Z diet study. The second figure shows who lose weight on the most effective diet (LCHF) and the least effective (low fat) taking insulin resistance into account. This result is huge and often overlooked by the traditionalists who often say to me “do whatever diet works for you”. Fair enough, but we have science on this. The low fat diet is only effective if you are insulin sensitive. Similarly, Volek and colleagues in a series of papers have showed that carbohydrate restriction has a more favorable impact on the metabolic syndrome than a low fat diet (see Volek FIGURES 1 and 2 below). They also showed recently in their PlosOne paper “Effects of Step-Wise Increases in Dietary Carbohydrate on Circulating Saturated Fatty Acids and Palmitoleic Acid in Adults with Metabolic Syndrome” that when you added more carbohydrates to the diet the saturated fats in the blood went up. Volek and colleagues FIGURE 1. 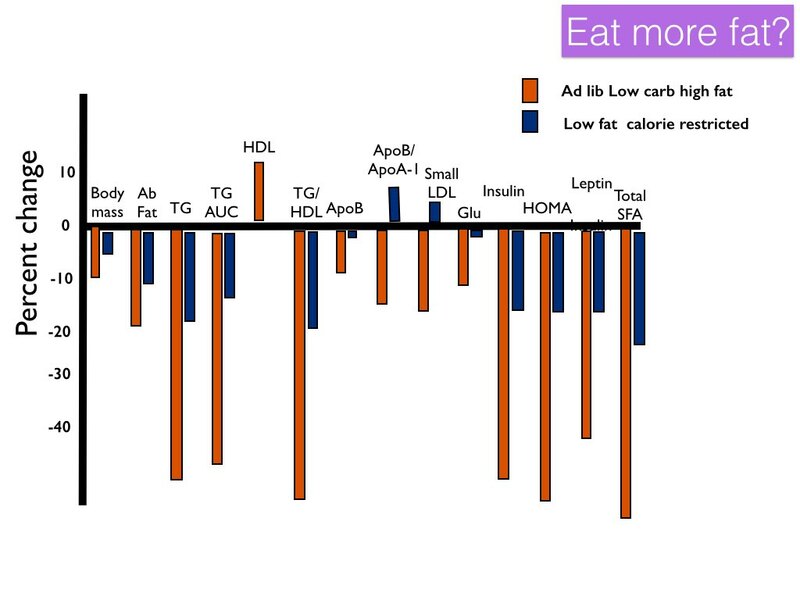 The orange bars show the metabolic profile response to LCHF (never) than response to Low fat high cab – blue). This study, amongst many others, shows that eating more carbs raises triglycerides and lowers HDL. 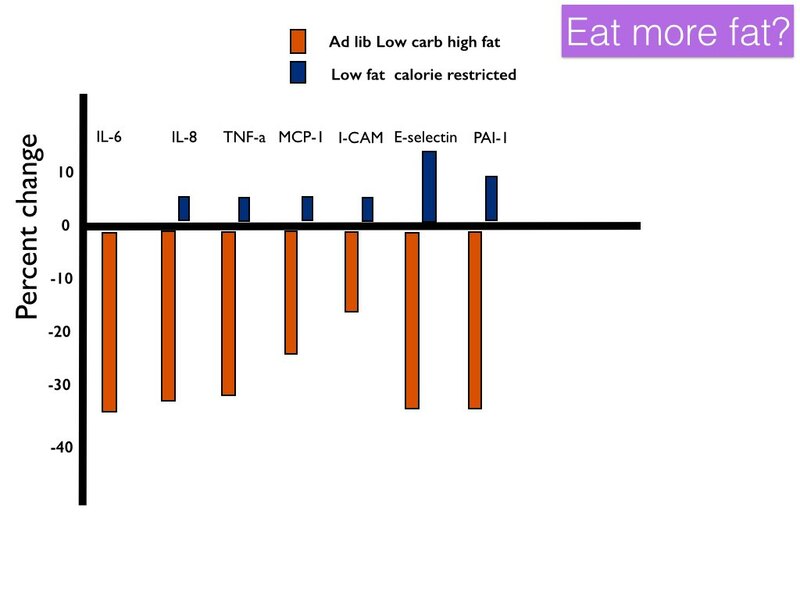 So eating low carb high fat rather than a low fat high carb diet is better for weight loss, especially if you are insulin resistant AND has a more favourable effect on the metabolic risk factors especially triglycerides, HDL, and ApoB measures. Scientists have been saying for a long time that getting too fat isn’t just about some lack of self-control (the volitional theory of eating too much). Rather insulin can block leptin signalling which stuffs up appetite control. As well, dopamine gets down-regulated in the hypothalamus and mesolimbic systems, making you crave simple carbs. This is the exact same mechanism as cocaine, nicotine and other addictions. Both of these result in a tendency to crave and over-consume – in the case of diet, to overeat carbs, especially sugar. Here’s what you get when you eat various types of fat (see figure below). Everything improves with all types of fat. Except LDL cholesterol and saturated fat. The main reason the traditionalists seems to get upset is that eating saturated fat tends to raise LDL cholesterol, which is associated with more heart disease (or risk of myocardial infarction – heart attacks) as in the second figure below. 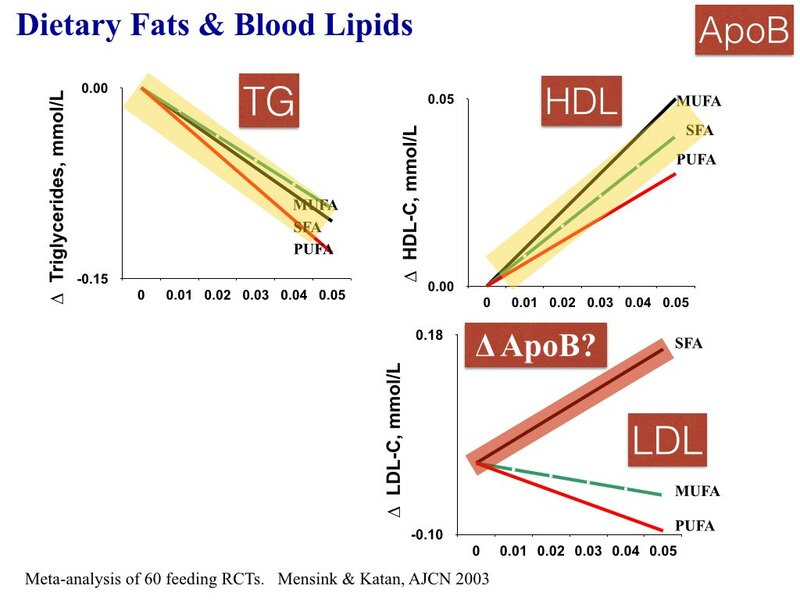 What is now emerging though is that not only does fat improve triglycerides and HDL cholesterol, but the change in LDL is only in the ApoA fraction. 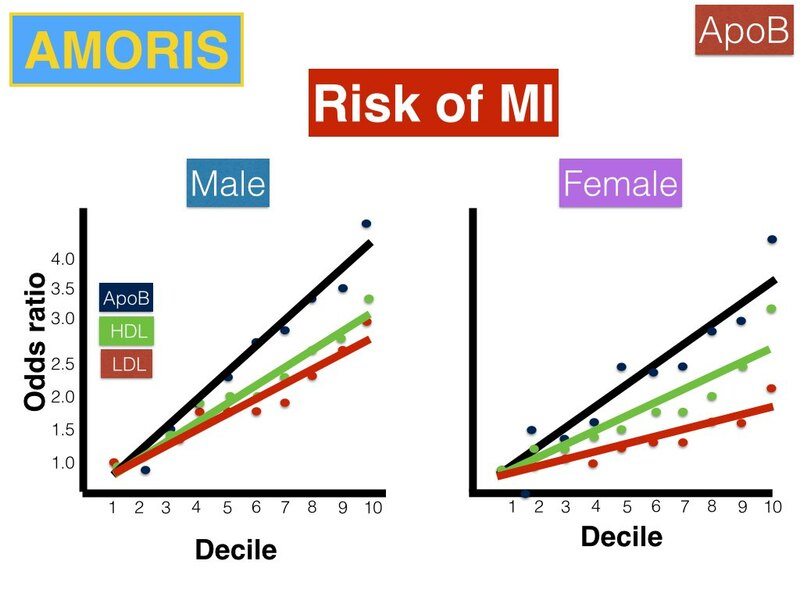 We don’t see increases in Apolipioprotein B, the so called small dense lipoproteins which are more strongly associated with poor health than LDL (again see second figure below). Fat isn’t the bad guy here. Sure if you want to eat the high fat- high carb processed food diet, then it’s probably going to end badly. 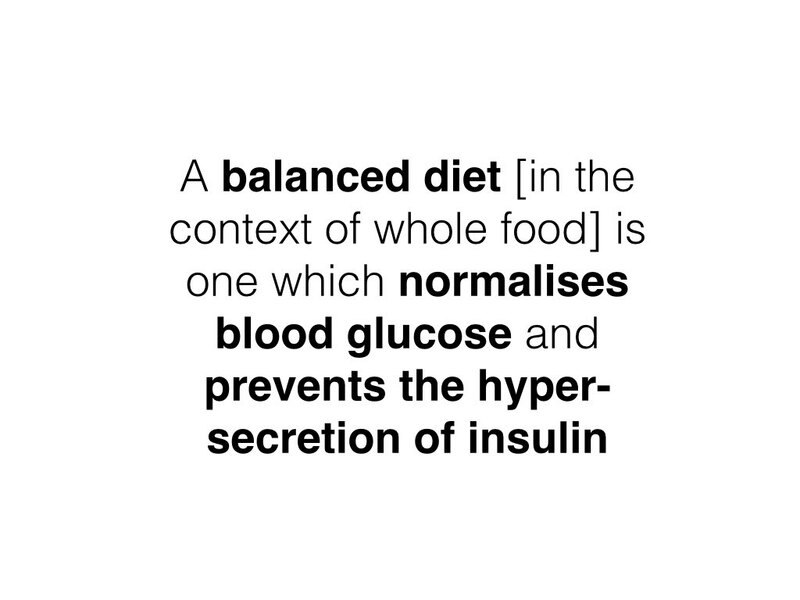 But in the context of whole foods fats are OK. What is most important to realise though is, that because we all vary in how insulin resistant we are, the amount of carbohydrate we can tolerate varies. This means that the amount of carbs my 14 year old son Sam can eat (he’s pretty insulin sensitive) and still maintain a stable blood glucose and normal insulin secretion, will be very different from someone who is older, female, overweight, and stressed out (all factors which are associated with more insulin resistance). If you are insulin resistant, eat less carbs, especially sugar. You are going to have to eat something to stay alive. Your options if you are low on carbs are extra protein or extra fat. Because extra protein beyond your daily requirements will turn into glucose anyway (called gluconeogenesis) that sort of defeats the purpose. So it’s going to have to be more fat! Luckily under the low carb conditions that’s safe and likely beneficial, NOT harmful for your health.